There is much discussion about the potential for artificial intelligence (AI) to transform our workplaces, possibly leading to fewer overall jobs and greater economic inequality in the future. This discussion has always made me wonder to what extent AI is already being used to produce goods and services. So, I was excited to learn about the AI Index from reading the recent Furman and Seamans paper on “AI and the Economy.” Furman and Seamans write: “The AI index, a non-profit project designed to track activity and progress in AI, provides a number of interesting facts designed to track the scientific progress in and impact of artificial intelligence and robotics.” I was even more excited to see the AI index reporting on “the growth of the share of US jobs requiring AI skills.” However, my excitement soon ended when I realized that the information they offered completely obscured the (lack of) importance of the underlying data, and I have to reluctantly conclude that the AI index offers extremely misleading hype on AI jobs rather than useful information. I am getting tired of overhyped phenomena, so this blog post is to alert the public. 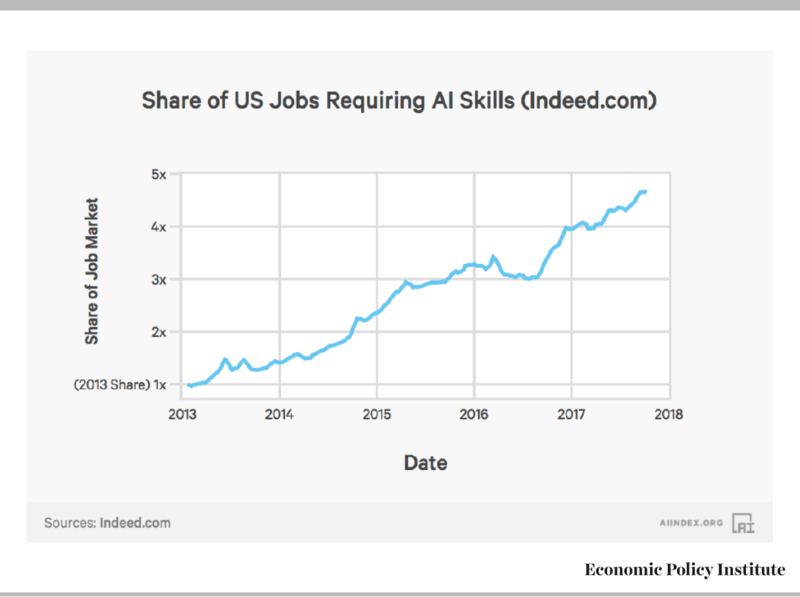 The AI Index highlights the fact that “the share of jobs requiring AI skills in the US has grown 4.5x since 2013” (see the graph below). That sounds like a huge explosion of jobs related to AI, right? But exactly how many jobs are they talking about being AI-related now compared with in the past? One cannot tell from their information, because while it shows the growth in the share of AI jobs, it provides no information of the level of these shares (either now or in the past). I am always careful to not present data showing the percent changes of percentages, because this is often misleading. For example, when a share rises from 1 percentage point to 2 percentage points, it has risen 100 percent. If a share rises from 20 percentage points to 22 percentage points, it has only risen by 10 percent. Yet in the latter example the change in the level of the share is twice as large (2 percentage points, compared to 1). So what does it tell us about the share of AI jobs in the economy today to tell us that this share has grown 350 percent, without telling us the initial level of the share? Absolutely nothing. 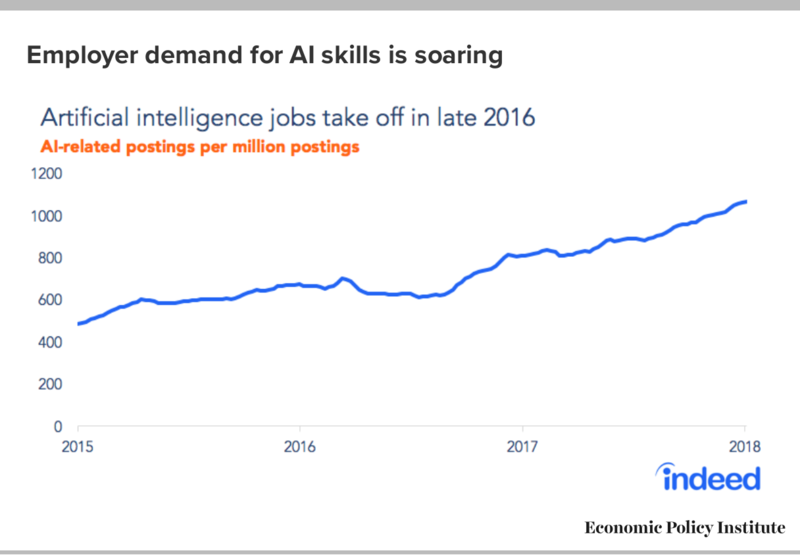 When I hear the conclusion that “employer demand for AI skills is soaring,” I assume this means that AI jobs are an important part of the labor market. But when you dig into the data, it seems clearly that they’re not. 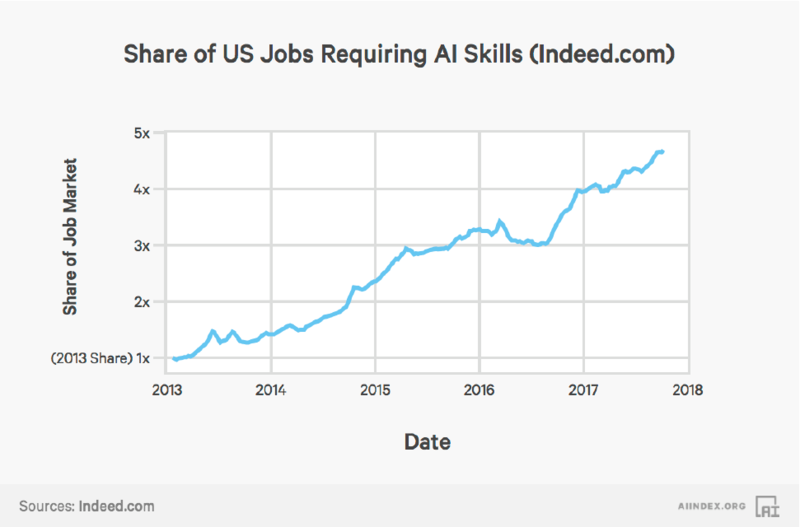 Indeed calculates the share of all job postings that are AI-related and report this share in the graph as the number of AI jobs per million. Note that the absolute numbers involved are tiny, rising from about 500 jobs per million at the beginning of 2015 to about 1050 per million at the beginning of 2018. 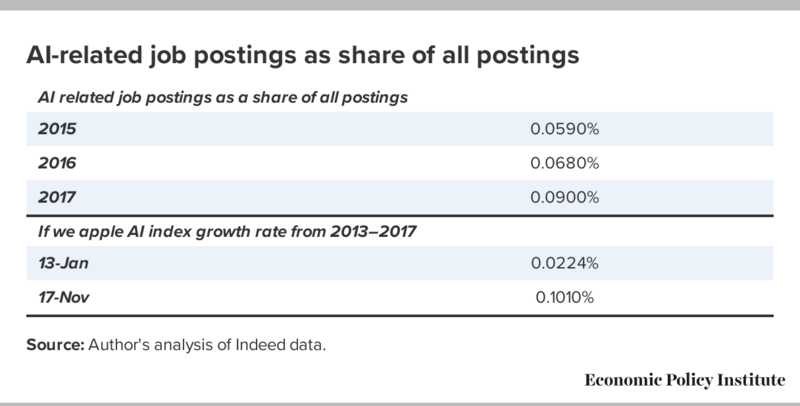 If one calculates the change in the actual share of job postings mentioning AI, one sees that this growth implies a shift from 0.05 to 0.105 percent of all job postings. In short, AI-related job postings are today minuscule, at about one in a thousand. Indeed was kind enough to provide the underlying data, which we present below in the table. If we combine these data with the estimated growth from the AI index, we can get a sense of growth between 2013 and 2017. 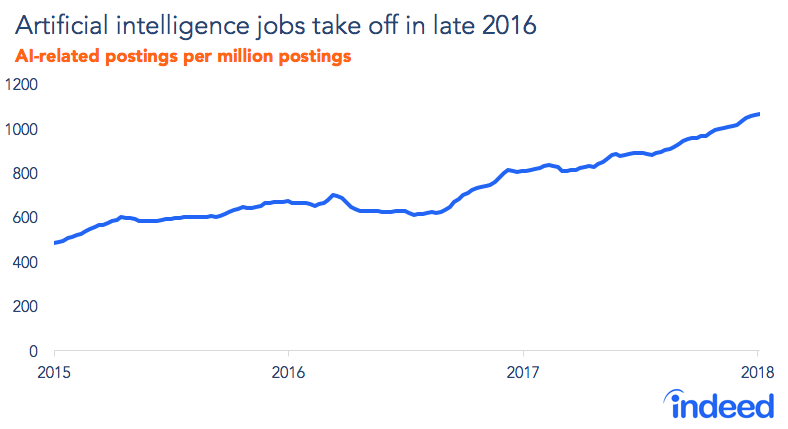 This estimated growth rate was 350 percent, which implies that the AI-related job share of total job postings rose from 0.022 percent to 0.101 percent between 2013 and 2017. That is what the AI Index is hyping as a major growth of AI-related jobs. If we used these percentages as shares of employment, and not as shares of total job postings, then the AI-related jobs would be seen as 32,000 at the start of 2013 and rising to 155,000 in late 2017. That’s rapid growth but hardly consequential to the wider labor market. Source: Author's analysis of Indeed data. These computations do provide an answer my original question. If AI-related employment corresponds to the implementation of AI in the production of goods and services then it is very much a very small phenomenon at this point. It could grow to be huge, but it is now pretty small. No need to hype the current state of AI jobs to make an argument that one should be concerned about AI in the future. In fact, doing so weakens the credibility of the argument.